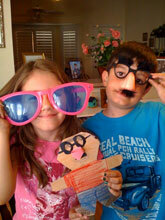 Flat Stanley gets accompaniment from two undercover agents in Las Vegas, Nevada. Art by Macky Pamintuan. Based on the character, stories, and adventures of Flat Stanley created by the late Jeff Brown. FLAT STANLEY® is a registered trademark of the Trust u/w/o Richard C. Brown f/b/o Duncan Brown.